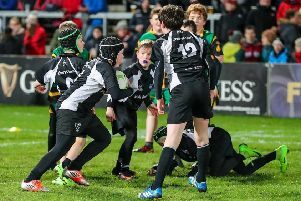 Banbridge Academy were simply too strong in all departments for a brave Antrim Grammar side as the Mid Ulster side cantered through to the second round. The home team had built up a 19-0 lead by half-time. Banbridge made their intentions clear from the kick-off when their winger, Michael McGaffin scored an unconverted try in the first minute. The home side were controlling the set piece plays, as well as affairs at the breakdown, in the early stages of the game. It came as no surprise when Ben Carson displayed sublime skill before he touched down for a try after 15 minutes. Daniel McElderry converted the try to put his team into a 12-0 lead. Banbridge Academy captain, Matthew Bell, was leading his team well and he showed great qualities before he scored the third try of the game just before the break. McElderry was successful with his conversion kick to give his team a 19-0 lead at the interval. It was more of the same for Banbridge in the second half. Their talented scrum half, Jay Pinion, ran in for a try three minutes after the re-start. McElderry converted the try to extend the lead to 26-0. Four minutes later, McGaffin ran in for his second try of the game - McElderry again converted. In spite of the best intentions of Antrim players JJ McKee, the Mawhinney brothers, James and Robert, team captain, Matthew Dunne and his backrow colleagues, Jacob McCollum and Daniel McGrandles, there was little they could do to prevent further scores for the home side. Banbridge second row forward, Peter Heaney, trundled in for a try which McElderry converted. With just five minutes of the game remaining, McElderry scored his team’s seventh try of the game - but failed to convert.